An article was recently published regarding the possibility of turning operating rooms in ambulatory surgery centers in 7-10 minutes. In this article the author talked about the fact that turning the rooms inside this time frame is still a possibility. I was left struck with, yet again, that we in the ambulatory surgery business took another detour somewhere. I recently responded to a previous article calling for surgery centers to consider moving toward a patient-centered environment. As someone who has been involved in the development of ambulatory surgery centers since 1979, I simply had to respond because back in the ‘old days’ this was what ASCs were all about. In reviewing the article about room turnover times, I was, once again, stuck with the fact that back in the early days of ambulatory surgery, we pledged to turn all our operating rooms over in 7-10 minutes—-patient to patient. Should the turnover time exceed 10 minutes, a QI study was immediately conducted to identify the problem/area for improvement. And yet, over the last twenty years, I have begun observing that these times are being extended. Some of the reasons put forth by ASC leaders for this extended time include the fact that more complex surgeries are being performed in the ASCs. Another issue presented during QA/PI studies is that our patients are more challenging. More and more centers are admitting ASA class III and more patients who require a great deal more attention. Care of the morbidly obese has become a big issue. The question arises, however, if these are valid reasons for longer turnover times, or is it just that we need to better plan for those challenges? The second question that arises is that if the condition of those patients validate the longer room turnover times, then what is going on that room turnover times, in general, are increasing? One could make an assertion that the industry, in its proliferation, has lost track of its roots—its initial commitments. Is it that more and more centers popping up means more and more hospital trained nurses being put in leadership roles with no distinctions from the freestanding ambulatory surgery center culture. As long ago as the early 1990s a study was done documenting room turnover times in hospitals. Understanding that the turnover times were being measured from patient out to next patient in, these times ranged from 45 minutes to 1 ½ hours. During this same study, it was observed that the average freestanding ASC was able to turn their rooms within the 7-10 minute time frame. Outlier times were identified for procedures where there were excessive irrigation fluids used, or in shoulder joint replacement surgeries. It was further documented that turnover times in hospital owned ASCs were primarily in line with hospital turnover times. In reviewing practices within 36 different ASCs, it has been noted that turnover times have been increasing exponentially with the exception of, universally, cataract surgery. However, even in this surgery, in multi-specialty centers, turnover times of 15 minutes has become acceptable. It was cataract surgery centers that perfected the ability to turn rooms in seven minutes with patients commenting that they knew they were on a conveyor belt kind of schedule, but that the personalization of their care was such that had they not observed this, they would not have known. It was further observed that turnover times for GU and GI procedures generally were far shorter than in other specialties, but still exceeded the 10 minute goal. We have to first look at the commitments of the staff and physicians. Are they aware that with the turnover times being inside the declared goal of 7-10 minutes, more procedures/cases could be performed and that this results in happier surgeons who are more likely to utilize their center more and more? Are they aware that greater utilization increases profitability and, thus, increases their chances of getting a raise or a bonus at year’s end? Are they aware that faster turnover times, means that patients get out of the center faster and aren’t left with long waiting room times? This makes for happier patients reporting back to their physicians. It is a ‘win-win’ all the way around. The staff has to be gotten on board with the possibility of faster room turnover times. You need to enroll them 100%! And this includes those physicians who like to hit the staff lounge to gossip, make calls, etc. Or who like to go to their office next door between patients. Educate them into what is possible in coming right back to the OR after they have seen their patient in recovery and the care person in attendance. It is impossible to experience rapid room turnovers without assessing the layout of your ORs and procedure rooms. Hospital operating rooms are typically equipped with large banks of storage cupboards which are usually stuffed full of supplies. In the ambulatory surgery industry it was quickly recognized that if the procedures were to be reimbursed on a ‘flat fee’ basis, rather than for every widget used, then it was imperative that supplies be strongly controlled. The basis materials management premise that supplies sitting on shelves have a powerful intrinsic cost become paramount in cost containment practices. Supplies were moved out of the ORs and were centrally located such that turning them and reducing PAR levels could be easily controlled. All supplies for the center were treated in this manner with the exception of those supplies only used in certain areas such as peel packs for the sterile processing area. Thus, all inventories were conducted out of the bulk and sterile storage areas excepting those specialized items stored in those specialized areas. This kept supply costs down significantly and reduced manpower hours in conducting weekly inventory and re-ordering of supplies. Operating rooms were equipped with one supply cupboard and one “case cupboard.” The inventory for the supply cupboards was limited to only those items that were essential as back up for items already pulled for the cases to be conducted in that room. These included two each of the various sized, most commonly used gloves, one package of sterile 2x2s, 4x4s, etc. Again, thought was put into what kind of cases were being performed in the center, what would be pulled from the two different storerooms to perform the procedure and what else might be needed because a glove was punctured or ripped, a gown sleeve contaminated, or additional sponges might be needed. However, staff considered what eventualities would drive them to tap into the back-up supplies. They considered the most common eventualities, rather than those that might be rare. Consideration was given that emergency supplies would most likely be found in anesthesia carts, but also considered what surgical supplies like drains, hemmorrhagic sponges, etc. should be stored in limited numbers in the room. The supply cupboard was never considered to provide everything needed to perform a case. Limits to the number of items stored there relied heavily on the concept that these were only ‘back-up’ supplies. The inventory stored in this cupboard was listed on an inventory sheet kept in the cupboard. The cupboard was restocked at the end of each operating day from the bulk or sterile storage areas. The restocking of this cupboard was identified on the duty list for each or staff to complete each day. This list required a date, a ‘completion’ check mark and the initials of the staff. A second cupboard was dedicated as a case cupboard. In cataract surgery, GI and GU rooms, two case cupboards were installed to allow for the increased volume. Each cupboard contained 6-7 shelves representing one shelf for each case scheduled for that room for that day. In looking at what it would take to get turnover times to that magical 7-10 minutes, staff met in one of the ORs and looked at every task performed in turning a room from the circulating nurse going with the anesthesia provider to take the patient to PACU, to delivering the soiled instruments to the soiled receiving area for processing, to mopping the room, cleaning the or bed…the whole gamut. AORN recommended practices and the center’s policies were reviewed and implemented for housekeeping and cleaning between cases. Job functions were reviewed and assigned. Who was to do what to turn the rooms was not only identified but embraced. Who was to grab the mop? Thrown out the window was any conversation about ‘not my job’. The OR Supervisor and the Executive Director both pitched in with the mop when needed, as did the physician. All kept the agreed upon goal clearly in mind. Mopping was not done during non-invasive procedures. Surgical team areas were identified for mopping between invasive procedures. It was agreed upon that at the end of the case the RN would take the patient to the PACU with anesthesia, give the hand off communication, visit the next patient scheduled for that room then return to the or to assist in the turnover. The organization employed a sterile processing technician to wash and process instruments. 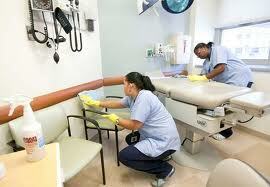 Any surgical technician not working a room was assigned to assist in the sterile processing and soiled receiving areas. At the end of the procedure the surgical technician removed the soiled instrumentation from the room to the soiled receiving area for processing and returned to the room to begin the turnover process. When the page for turnover was heard, any available staff reported to that room. The staff lounge was reserved for assigned breaks and lunches. The organization also employed an orderly, receiving, housekeeping, maintenance person who helped as available turn rooms in this seven-OR facility. However, whoever was available either grabbed a mop or begin wiping off the flat surfaces and or bed with the germicidal solution. The OR was equipped with a soiled linen hamper, a biohazardous waste hamper, a general waste hamper and two kick buckets—one for anesthesia and one for sponges. At the end of the case, these were emptied and disposed according to recommended practices and standards. In identifying all the elements involved in turning a room the staff noted the hamper liners, kick bucket liners and the linen needed for the or bed as routine. Physician procedure cards were scrutinized and updated as necessary. Staff met and agreed to follow these rigorously in pulling cases. It was decided that all cases would be pulled the afternoon prior to the procedure. All supplies would be put on the shelves in the close cupboard designated as the case cupboard. Each shelf would be labeled; e.g., #1, #2, etc. The cupboard shelves were equipped with a lip around the entire shelf and pulled out of the cupboard allowing it to be used as a transporting tray. The organization approached the local grocery store and were able to get, free of charge, grocery carts with those irritating wobbly wheels. These carts were cleaned up and the wheels were changed out transfiguring them from grocery carts to supply carts. Staff used these to transport supplies from the bulk and sterile storage areas and to pick their cases. Staff, following their procedure cards, pulled every item needed for each case and placed those on the assigned shelf in the case cupboard. As part of the process for rapid room turnovers, the staff developed a system for “room turnover packs.” These consisted of the OR table/bed sheet, the draw sheet, the kick bucket liners, and the various hamper liners. Staff were assigned daily to make these packs by gathering all the items and making rolls that were held in place with a strip of masking tape. These were kept at the OR control desk. When pulling cases the staff person would pull however many of these rolls needed based on the number of cases scheduled for that room for the next day. One of the rolls was placed on each shelf with the supplies for the case. Once the room was cleaned, the RN or other staff person, as agreed in their assignment meeting, would pull the roll, make the table/bed and place the liners in the appropriate spot. The surgical technician would pull the pack and place it on the back table and begin draping the instrument table and mayo stand . The RN Circulator began assisting in the opening of sterile supplies and dropping them onto the sterile field while the surgical technician scrubbed. The RN then would set up the prep table, then leave the room to collect the patient with the anesthesia, provider. Upon re-entering the room, the RN finishes gowning the tech and physician and turns to assist anesthesia in sedating the patient as needed. 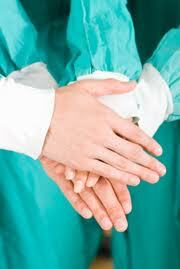 Many larger organizations are turning to developing and/or hiring an anesthesia technician. Certification for this person is available on the internet, but in-house training on the part of the anesthesia providers is acceptable. This person can be quite valuable in assisting in room turnovers, too. In the absence of an anesthesia technician the anesthesia providers have to assume an “assistive” position in turning rooms. Include them in your training. In the absence of an AT, the medication management nurse should be assigned the job of keeping the anesthesia carts fully stocked. The system/process described above will absolutely allow you to turn rooms within the identified national standard of 7-10 minutes. However, it is crucial to this process, that each staff person remember that every time someone leaves a room to go fetch something, it is manpower hours that translate to increased room turnover times. 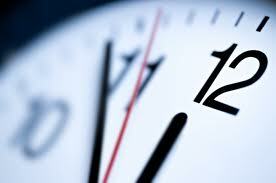 Plan to review your turnover times at least twice a year. Develop an electronic log and assign a data entry person the task of documenting times patients enter and leave rooms to facilitate your study.